"All creative art is magic, an evocation of the unseen in forms persuasive." Whether in magic or in art, essential to this evocation is a dialogue between the magician or artist and his audience, since experience of the magic or art is fundamental to its existence. In the case of art, there is a dialogue as well, sometimes difficult, usually complicated, between the artist and her materials, the artist and her influences and, not least, the artist and the viewer who completes the work. In this last interaction, there is often another dialogue, that between the seller and the consumer. 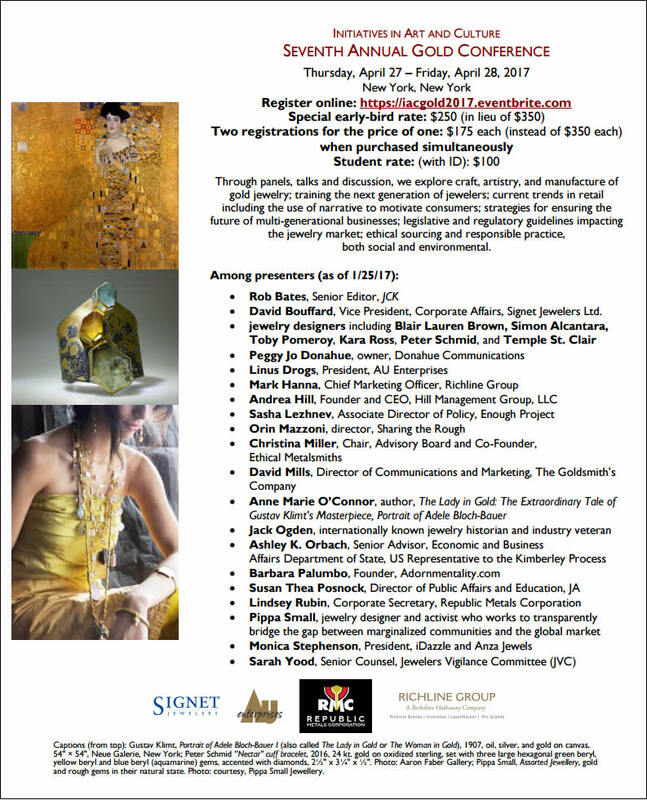 In this, the Seventh Annual Gold Conference, we consider this complex, multifaceted dialogue as it applies to gold, whether in jewelry, in other art forms such as painting, or in its elemental state. Consideration of Klimt's Woman in Gold affirms the need for the viewer's gaze to complete the picture, and the exchange between the viewer and object is at the heart of the dialogue that is storytelling. Gold is a symbol of ultimate emotional power. This affirmation forms the foundation of our inquiry, in which jewelry serves as the point of departure. We consider great jewelers and their work, focusing on the interplay between them and their materials, the tools they use, those who trained them, and those whom they themselves will train and influence. We look too at the relationship between gold objects and those who experience them, and since gold's privileged status is not a product of chance, how that relationship is inevitably affected by legislation, regulation, and world events. An increasing commitment to ethical sourcing and sustainability has impacted not only the ways in which gold is brought to market but how fine jewelry is created with a commitment to the fusion of ethical sourcing and aesthetic satisfaction. Great jewelry tells a story, whether of provenance, of milestone moments, or of origins. These tales can be told in many ways, with film, TV, print, digital, and social media playing distinct roles. Regardless of means, however, story-telling is yet another dialogue, one that ultimately plays out at the level of the seller. We thus turn our attention to the ways in which brick-and-mortar retailers of gold jewelry can craft compelling campaigns, create extraordinary sales environments, and draw the consumer; at the level of the Internet, we consider whether or how the "luxury experience" can be delivered on-line. Whether brick-and-mortar or on-line, successful sellers must tailor the retail experience for heterogeneous audiences, not least as defined by age and gender. Last we consider the roles technology, will increasingly play for jewelers and in the marketplace. Ultimately, change is part of an endless dance, really, in which the essence of art, the true essence of the object, is forever unfixed, its aesthetic worth, its desirability, its monetary value, subject to an interplay of complex and varying forces, perceptions, and circumstances. David Bouffard, Signet Vice President, Corporate Affairs, Signet Jewelers Ltd.